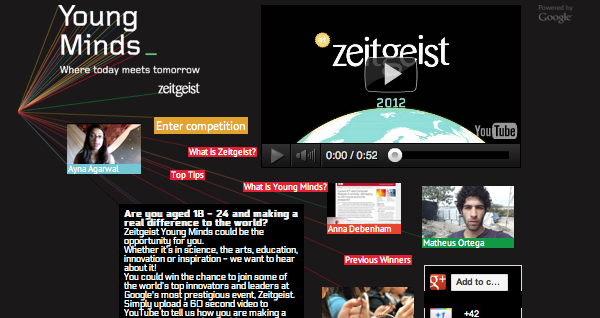 Google has announced a search for participants for this year’s edition of its Zeitgeist Young Minds program. Ten 18-24 year-olds who are making an impact in their communities in the areas of science, the arts, education, leadership or innovation will be chosen to attend the even taking place in the UK later this year. Interested parties will have to upload a video, no longer than a minute, showing how they are making a difference in their communities. Are you between 18 and 24 years old and have done something to make an impact in the world? Do you fancy the opportunity to come to the UK and meet some of the great minds of our time? If so, apply by March 19 to Google’s youth challenge, Zeitgeist Young Minds, by uploading a short video telling your story, what matters to you and how you’re making a positive impact on your world. We want to find the most exceptional and inspiring young people who are helping others through science, the arts, education, leadership or innovation. The inaugural ‘Young Minds’ competition rewarded a series of pathbreakers, ranging from a student who launched free hip-hop dance classes for high-risk youth to a South African AIDS activist to a student who founded an organization offering IT education.